This article first appeared in Fermilab Today on Jan. 24. 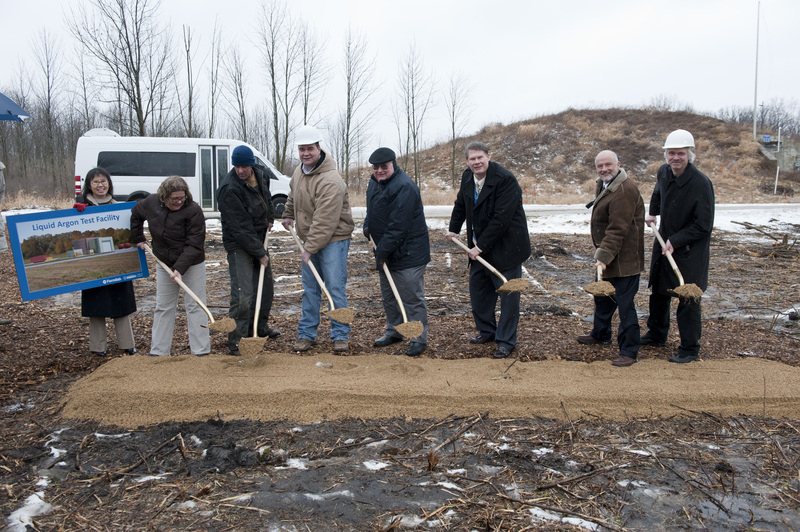 Despite the biting cold and snow, scientists and Fermilab personnel gathered outside to break ground for Fermilab’s new Liquid Argon Test Facility. The facility, expected to be completed spring 2013, will house liquid-argon based experiments. Scientists have speculated since the 1980s that liquid argon could be used as a crash pad for high-energy neutrinos and have subsequently constructed several liquid-argon neutrino detectors; the largest and most prominent being ICARUS, the Imaging Cosmic And Rare Underground Signals, detector in Italy. The design of the new MicroBooNE experiment improves upon technology developed for ICARUS and will allow scientists to observe neutrinos with greater precision and resolution. Regina Rameika is the project manager for the construction of the MicroBooNE detector. “The MicroBooNE detector that will first use this facility is smaller than ICARUS, but incorporates some advanced designs,” Rameika said. MicroBooNE will use liquid argon as a target for neutrinos generated in the Booster neutrino beam. When the neutrinos hit the argon nuclei, they generate showers of charged particles that then drift to an electrical detector. The purer the argon, the further the particles are able to drift. MicroBooNE will use ultrapure argon to maximize the distance these particles drift. 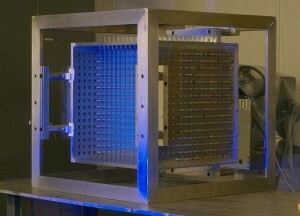 This model is more efficient, cost effective, and has the potential to be scaled-up to a much larger size than previous detectors. The MicroBooNE experiment will provide another layer of data for using the Booster neutrino beam. Not only will scientists be able to observe particles with the existing MiniBooNE detector, but now they will be able to measure neutrinos from the Booster neutrino beam with a second, higher-resolution detector. “The MicroBooNE experiment will be focused on understanding some anomalies observed in the data from the MiniBooNE experiment,” Rameika said. This project will also provide valuable insight into different designs for liquid-argon detectors that could be located in the LArTF once MicroBooNE is complete. This column by Fermilab Director Pier Oddone appeared in Fermilab Today on Jan. 17. Last week we hosted the US-UK Workshop on Proton Accelerators for Science and Innovation. The workshop brought together scientists from the United States and the United Kingdom who are working on high-intensity proton accelerators across a variety of fronts. The meeting included not only the developers of high-intensity accelerators but also the experimental users and those involved in the applications of such accelerators beyond particle physics. At the end of the conference, John Womersly, CEO of the UK’s Science and Technology Facilities Council, and I signed a letter of intent specifying the joint goals and activities of our collaboration for the next five years. We plan to have another workshop in about a year to review progress and explore additional areas of collaboration. Our collaboration with scientists from the United Kingdom in the area of high-intensity proton accelerators is already well established. We have a common interest in muon accelerators, both in connection with neutrino factories and muon colliders. Both of these future projects require multi-megawatt beams of protons to produce the secondary muons that are accelerated. We collaborate on the International Muon Ionization Cooling Experiment at the Rutherford Appleton Laboratory. MICE is the first muon cooling experiment and an essential step in the road to neutrino factories and muon colliders. We also collaborate on the International Scoping Study for neutrino factories. In our current neutrino program we are very appreciative of this collaboration and U.K. expertise in the difficult mechanical design of high-power targets, in particular for the MINOS, NOvA and LBNE experiments. The design of these targets is quite challenging as the rapid deposition of energy creates shock waves that can destroy them.The Project X experimental program also depends on having appropriate megawatt-class targets relatively close to experimental set-ups. One of the primary interests in applications outside of particle physics is the development of intense proton accelerators that could be used for the transmutation of waste or even the generation of electrical power in subcritical nuclear reactors. The accelerators necessary for such subcritical reactors could not have been built just a decade ago, but the advent of reliable superconducting linacs changed that. Several programs abroad are developing such accelerators coupled to reactors. While the United States has no explicit program on accelerator-driven subcritical systems, the technologies that we are developing for other applications, such as Project X, place us in a good position should the United States decide to develop such systems. Overall, the workshop was very productive and the areas of potential collaboration seemed to multiply through the meeting. Each one of the five working groups is preparing a brief summary of the potential areas of collaboration as well as a specific and focused plan for the next year. The largest map of dark matter made with direct measurements, unveiled today by two teams of physicists at the U.S. Department of Energy’s Fermilab and Lawrence Berkeley National Laboratory (Berkeley Lab) removes a key hurdle for tracing the history of dark energy in the universe using ground-based telescopes. 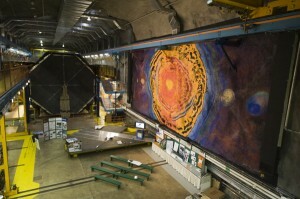 This work done by members of the Sloan Digital Sky Survey collaboration points to greater successes for upcoming sky surveys, including the Dark Energy Survey, which will turn on the Dark Energy Camera on the Blanco Telescope later this year, and then the Large Synoptic Survey Telescope and the HyperSuprimeCam survey. To find and map the invisible dark energy and dark matter that make up about 96 percent of the universe, physicists look at their effects on the matter and radiation we can see, namely galaxies. Surveying galaxies from Earth-based telescopes is cheaper than satellite-based experiments but had traditionally had the drawback of having to make due with a less clear view of the sky. The same atmospheric distortions that make stars twinkle blurs attempts to track invisible dark matter in the universe made by measuring the distortion of background galaxy shapes, a process called weak lensing. DES and LSST will use this technique to create the largest galaxy surveys ever, covering more than one-eighth of the sky. Layering photos of one area of sky taken at various time periods, a process called coaddition, can increase the sensitivity of the images six fold by removing errors and enhancing faint light signals. The image on the left show a single picture of galaxies from the SDSS Stripe 82 area of sky. The image on the right shows the same area with the layered effect, increasing the number of visible, distant galaxies. Credit: SDSS. Layering photos of one area of sky taken at various time periods, a process called coaddition, can increase the sensitivity of the images six fold by removing errors and enhancing faint light signals. The image on the left show a single picture of galaxies from the SDSS Stripe 82 area of sky. The image on the right shows the same area with the layered effect, increasing the number of visible, distant galaxies. Credit: SDSS.Particle physicists and astronomers from Fermilab and Berkeley Lab have demonstrated a new technique for weak lensing that lessens the blurriness and allows researchers to see fainter galaxies, providing a younger picture of the universe. The two teams essentially layered snap shots of these distorted galaxies, in a process called coaddition, to remove errors caused by equipment or atmospheric effects and to enhance very faint light signals coming from deep in the universe. Both teams depended upon extensive databases of cosmic images collected by the Sloan Digital Sky Survey, SDSS, which were compiled in large part with the help of Berkeley Lab and Fermilab. “These results are very encouraging for future large sky surveys. The images produced lead to a picture of the galaxies in the universe that is about six times fainter, or further back in time, than is available from single images,” says Huan Lin, a Fermilab physicist and member of SDSS and DES. Surveys of galaxies across large swaths of the sky track how clumps of dark matter have changed over time as dark energy exerts its repulsive push on them. Clumps of dark matter not only distort the images of galaxies behind them, but they determine how galaxies cluster around them. By combining this information with redshift data, the observed change in the color of light emitted by a star or other celestial object that is moving away from Earth, it’s possible to trace how the distribution of matter in the universe has evolved over time, offering insight into the growth of dark energy. Researchers hope this new tool will help answer one of the largest questions for upcoming dark energy surveys and in cosmology: whether dark energy is what Einstein called a “cosmological constant”, a counterbalance to gravity’s pull on matter? Or is it something else such as gravity behaving differently at cosmic scales. The variation or lack of separation between clusters of galaxies and within the clusters across time will lead to new insight into this question. To build one of the largest maps of dark matter and track its evolution across eras, the teams looked at two manifestations of gravitational lensing: those caused by large galaxy clusters and those caused by the overall distortion spread across the large scale structure of the universe. This second effect is called cosmic shear. Both of these distortions are caused by the gravitational fields of clumps of dark matter acting as lenses, bending the light from galaxies behind them. This distorts the shapes of these distant galaxies, making them look more elliptical. By measuring the ellipticities, or amount of distortion, physicists can infer properties of the dark matter, such as its abundance and how clumpy it is and the masses of the clusters. 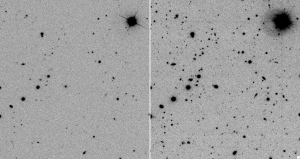 “This image correction process should prove a valuable tool for the next generation of weak-lensing surveys,” Lin says. 2011 has been a year of change and excitement. We’ve had plenty of good news and bad news to deal with. The new year doesn’t mean just another calendar on the wall, it means a new way of looking at physics. There’s no better way to bring in the new year than watching the fireworks in central London, surrounded by friends. There’s usually a fantastic display, because London is not only one of the most important cities in the world, but it’s also home of universal time. With the Greenwich Meridian running through the capital, we’re reminded of the role that timekeeping has played in the development our history and our science. But this year was even more special, since London is literally inviting the world to its streets this year for the Olympics. So I got caught up in the excitement of it all my thoughts turned to what we’ve seen in the world of physics, and where we’re going next. 2011 got off to a start with ATLAS announcing a startling asymmetry in the jet momenta in heavy ion collisions. However, the joy was tainted by a leaked abstract from an internal document. That document never made it through internal review and should never have been made public. We were faced with several issues of confidentiality, ethics and biases, and how having several thousand people, all armed with the internet and with friends on competing experiments makes the work tough for all of us. In the end we followed the right course, subjected all the analyses to the rigors of internal and external review, and presented some wonderful papers. There was more gossip over the CDF dijet anomaly presented at Blois. CDF saw a bump, and D0 didn’t. Before jumping to any conclusions it’s important to remember why we have two experiments at Tevatron in the first place! These kinds of double checks are exactly what we need and they represent the high standard of scientific research that we expect and demand. The big news for Tevatron was, of course, the end of running. We’re all sad that the shutdown had to happen and grateful for such a long, productive run, but lets look to the future in the intensity frontier. Meanwhile both ATLAS and CMS closed in on the Higgs boson, excluding the vast majority of the allowed regions. The combinations and results just got better and better, until eventually on December 13th we saw the result of 5fb-1 from each experiment. The world watched as the presentations were made and quite a few people were left feeling a little deflated. But that’s not the message we should take away. 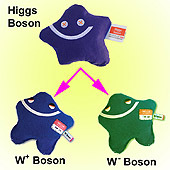 If the Higgs boson is there (and it probably is) then we’ll see by the end of the year. There’s no more of saying “Probably within a year, if we’re lucky”, or “Let’s not get ahead of ourselves”. This time we can be confident that this time next year we’ll have uncovered every reasonable stone. The strategies will change and we narrow the search. We may have new energies to explore, and we’ll tweak our analyses to get more discriminating power from the data. Now is the time to get excited! The game has changed and the end is definitely in sight. It’s been a good year for heavy flavor physics as well. LHCb has gone from strength to strength, probing deeper and deeper into the data. We’ve seen the first new particle at the LHC, a state of bottomonium. Precision measurements of heavy flavor physics give some of the most sensitive tests of new physics models, and it’s easy to forget the vital role they play in discover. ALICE has been busy exploring different questions about our origins, and they’ve studied the quark gluon plasma in great detail. The findings have told us that the plasma acts like a fluid, while showing unexpected suppression of excited bottomonium states. With even more data from 2011 being crunched we can expect even more from ALICE in 2012. The result that came completely out of left field was the faster than light neutrinos from OPERA. After seeing neutrinos break the cosmic speed limit, OPERA repeated the measurements with finer proton bursts and got the same result. Something interesting is definitely happening with that result. Either it’s a subtle mistake that has eluded all the OPERA physicists and their colleagues across the world, or our worldview is about to be overturned. I don’t think we’ll get the answers in the immediate future, so let’s keep an eye out for results from MINOS and OPERA. Finally it’s been an incredible year for public involvement. It’s been a pleasure to have such a responsive audience and to see how many people all across the world have been watching CERN and the LHC. A couple of years ago I would not have thought that the LHC and Higgs boson would get so much attention, and it’s been a of huge benefit to everyone. The discoveries we share with the world are not only captivating us all, they’re also inspiring the next generation of physicists. We need a constant supply of fresh ideas and new students to keep the cutting edge research going. If we can reach out to teenagers in schools and inspire some of them to choose careers in science then we’ll continue to answer the most fascinating, far reaching and beautiful questions about our origins. So when you a raise a glass to the new year, don’t forget that we’ve had an incredible 2011 for physics, and that 2012 is going to deliver even more. We don’t even know what’s out there, but it’s going to be amazing. To physics! As a postdoc, Giovanni Tassielli has the whole particle physics landscape to survey for the most stimulating future job prospects. The researcher from INFN in Italy feels a pull toward the most challenging experiments at the Intensity Frontier: those that seek out the rarest of all particle interactions, the smallest of effects and provide a glimpse of physics beyond what experiments at particle colliders can reach. Intensity Frontier experiments such as Mu2e look for occurances that are not only difficult to detect, like pulling a needle out of a haystack, but occur very rarely. It is as if the needle only existed in one out of hundreds of haystacks. “I love the precision,” said Tassielli while attending a Department of Energy-organized workshop in Washington, D.C., last week to explore scientific opportunities at the Intensity Frontier. This research area uses densely packed particle beams and complex detectors to allow physicists to see particle interactions occurring as rarely as once in a million million times. Tassielli says it’s a research area that the world should invest in exploring to expand our understanding of nature, just as other scientists explore the depths of the ocean or craters of the moon. The Fundamental Physics at the Intensity Frontier Workshop was set up to survey existing research and future scientific possibilities in this area, and to gauge the level of interest from the physics community. Organizers had to start turning people away after the 515 participant cap was reached more than a week before the workshop. Participant enthusiasm and energy exceeded expectations, said Glen Crawford, head of the research and technology division of DOE’s Office of High Energy Physics. Yuhsain Tsi, a theory postdoc from Cornell University, said he’s interested in neutrino physics because Intensity Frontier science has as much discovery opportunity as other areas of particle physics. Registration for the Intensity Frontier Workshop was cut off at 515 people because of space contstraints. Physicists spent three days in six working groups listening to more than 100 presentations identifying promising research areas that use neutrinos, nucleons, nuclei, heavy quarks, charged leptons and exotic particles such as axions. The consensus was that a host of experiments have the potential to answer the biggest questions: How did the universe begin? What is it made of? How does it work? How did we come to exist? Answers from this research could aid studies in cosmology, nuclear physics and other areas of particle physics. “What came out was that there is a broad program that has interconnections inside the Intensity Frontier and outside the Intensity Frontier that addresses fundamental symmetries of physics,” said workshop co-convenor Harry Weerts from Argonne National Laboratory. Experiments probing the Intensity Frontier are currently running in Europe, Asia and the United States, with more proposed for the future. Flip Tanedo, a theory postdoc from Cornell University, said the ability to work face-to-face with experimental colleagues on an experiment in the United States is a key draw of the Intensity Frontier and opens the door to more productive research. The results of the workshop will be summarized in a report that will be presented to the DOE and the High Energy Physics Advisory Panel before its March meeting. This report will provide a survey of the physics community’s thoughts about the Intensity Frontier and its scientific potential. 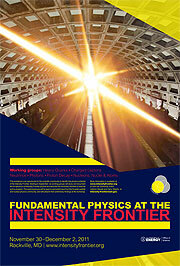 Editor’s note: Follow the hashtag #intensityfrontier for information from the workshop. At the Intensity Frontier, scientists use high energy beams and sensitive particle detectors to explore rare subatomic processes in search of answers to profound questions. More than 500 scientists are gathering this week to discuss the future role of the U.S. in these experiments. They will discuss the most exciting opportunities, the potential for new discoveries and the equipment and technology required for these new experiments. The workshop, named “Fundamental Physics at the Intensity Frontier” and held from Nov. 30 to Dec. 2 near Washington, D.C., is split into six working groups. Speakers from each group will provide an overview of their study area and its future goals to an audience spanning the breadth of the physics community. Then medium-sized groups will break away for debates and discussions designed to stimulate open conversations. “This will be a good opportunity for people in more specialized areas to interact and learn from each other and hopefully reinforce each other’s case for this physics,” said Jack Ritchie, a co-convener for the Heavy Quarks group and professor in the physics department at the University of Texas, Austin. In recent years, the Intensity Frontier has become a top priority for fields like nuclear physics, according to Michael Ramsey-Musolf, a physics professor at the University of Wisconsin at Madison and a co-convener for the Nucleons, Nuclei and Atoms group. “There’s a lot of synergy between high-energy physics, nuclear physics and cosmology and they all meet at the Intensity Frontier field,” he said. 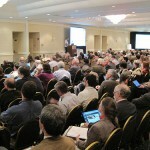 The workshop also brings together scientists from similar research areas, such as muon physicists from experiments like Muon g-2, Mu2e and the proposed Long-Baseline Neutrino Experiment, according to David Hertzog, a University of Washington physics professor and member of the Charged Leptons group. While the DOE’s Office of Science will use the event to evaluate the science opportunities for the U.S. particle physics community in this field, the workshop will also be a learning experience for those new to the Intensity Frontier. From graduate students to Fermilab physicists and DOE staff, the community in attendance will comprise a large spectrum of physics professionals. The working groups have spent months preparing for the workshop. This article first appeared in Fermilab Today, Nov. 4. Originally a prototype for a 10-ton version called FINeSSE, SciBath has taken center stage for the project. It’s mounted to a cart that has been craned into the MINOS tunnel, 100 meters underground. When a neutron created in Fermilab’s NuMi neutrino beam reaches the SciBath cube, it hits 70 kilograms of liquid scintillator. If the neutron strikes a charged particle like a proton, the scintillator transforms the energy into light that can be detected by the highly sensitive wavelength-shifting fibers. The fibers, 768 in all, capture blue light emitted from the interaction and shift it to a green wavelength that can be read by the phototubes. Specially designed readout boards record the information. Analysis software will then reconstruct the neutrino track within an innovative 3D grid. “The purpose of SciBath is threefold,” said graduate student Lance Garrison. He is one member of the SciBath research team, which also includes postdoc Robert Cooper and graduate students Lori Rebenitsch and Tyler Thornton. SciBath has been in the MINOS tunnel for more than a month, and the plans are for it to stay through December, depending on its success. So far, it’s performing well. This article first appeared in Fermilab Today, Nov. 2. Last month we celebrated the final chapter in Tevatron operations. Already, as I go through the CDF and DZero buildings I see major changes. Partical Physics Division technical teams are securing the detectors and preparing the buildings for their next use. At CDF the work inside the building is going at a furious pace to match the construction schedule of the Illinois Accelerator Research Center building, and at DZero we are clearing out two decades of equipment from the high bay to prepare for construction of the MicroBooNE experiment, starting right after Christmas. This work helps us to close a historic chapter for the lab and helps usprepare for the next one. The director and DOE have articulated a clear focus for particle physics in the three experimental frontiers: Energy, Intensity and Cosmic. With the close of the Tevatron, PPD’s focus on the Intensity Frontier has gotten even stronger, mirroring the direction of the future program in the U.S. At the end of November, many PPD scientists will travel to Rockville, MD to participate in a DOE Office of Science Intensity Frontier workshop that will help define our future work. There are exciting opportunities at the Intensity Frontier to build and operate experiments that use rare processes to search for new physics. For some, their study requires intense beams and large detectors. In others, highly precise detectors capable of distinguishing between rare processes and mundane backgrounds are needed. At the workshop, we will work to identify these opportunities, determine what can be learned, assess what can be done with current facilities and technology, and explore what new facilities or new technology are needed to reach this frontier’s full physics potential. Many of PPD’s most talented people, both experienced and early in their careers, have been preparing materials and case studies for some time. They are still recruiting help for the final push that is needed during the next few weeks. The results that come out of the workshop will help DOE provide direction for the field, and for the work that PPD scientists, engineers, technicians and staff will focus on for the next decade. –Mike Lindgren, head of the Fermilab’s Particle Physics Division, wrote this column.